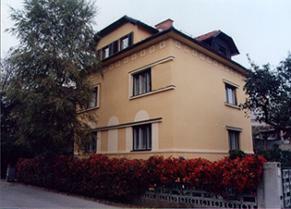 We are located in Kranj, only 12 kilometers away from the Airport of Ljubljana easily accessible by car or taxi. Kranj is just 30 kilometers away from Ljubljana – the capital of Slovenia - if you are coming from that direction. - after approximately 200 meters you will see Spar food market and retail store on the right. You can easily park in this neighborhood. 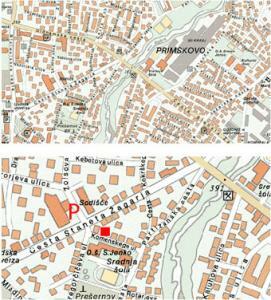 - walk across the road you just came from and turn left onto Komenskega street, where you will find our Studio in yellow villa (opposite to the Primary school of Simon Jenko). Press the lowest doorbell or give us a ring and we will come to open the gate for you. Please do call us if you are running late or you get lost. We would be happy to assist you on the following mobile number: 00386 31 444868 or 00386 31 302367. We can direct you or we can also pick you up at the airport. If you are coming by car equipped with the Navigation system we suggest you to follow the directions on you Navigation screen.